Cystic Fibrosis, or CF, affects the lungs and the digestive system. CF is the most common, fatal, genetic disease affecting Canadian children and young adults. Forty years ago, most children with CF did not live long enough to attend kindergarten. Today, half of Canadians with CF are expected to live into their 40s and beyond. While life span has improved for patients with CF, quality of life is still an issue. Daily treatments, medication, clinic visits and health challenges are always present. For us, when Katie is healthy, we do two treatment sessions a day with her. When she is sick (cold, flu, etc. ), we do three or four treatment sessions with her. 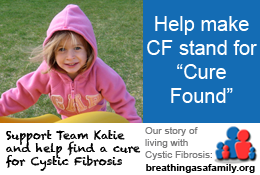 You can find out more about CF at the Cystic Fibrosis Canada. We wanted to let you know about our new Everyday Health television series! Each episode profiles ordinary people who overcome extraordinary obstacles and who are helping others lead healthier, happier lives. Laila Ali, Ethan Zohn and Jenna Morasca will host the weekly program. We think the visitors of breathingasafamily.org will find Claire’s story to be fascinating and inspiring. Please let me know if you are able to share this story and point people to the site page so that we can give you a Twitter shout out to the Everyday Health community!